At the beginning of September 2011 everyone was excited about the good news that we had negotiated to lease the piece of land that is next to school from Paradigm Housing. It was an overgrown area at the end of the garages on Elm Tree Hill. It was quite often used as a dumping ground for litter and had been an area of disrepute! We make good use of our outside space at Elmtree, but are always looking for ways to improve the environment for our children. We wanted to develop this land into a fabulous Sensory Garden for our children. And, we wanted the children to design it. So what is a Sensory Garden? We discussed it at assemblies and in class. All gardens can stimulate the senses. In sensory gardens, plants and other design elements are selected with the intention to provide experiences for seeing, smelling, hearing, touching, and tasting. We wanted the garden to be the children’s vision of a Sensory garden and for our parents and neighbours to help with the organisation and hard landscaping too! We held a competition to ask the children to write and/or draw their vision of Elmtree’s Sensory Garden. We had 8 winners and their designs have been interpreted by a local Garden Designer. Take the children for a walk along a sensory trail throughout the garden. Have them touch various plants and ask them to describe how they feel. Have them also describe what they see, hear, smell, and taste as well. Send them on a scavenger hunt for various sensory plants from each area. For example, allow them to collect objects of colour (yellow flowers) for sight or textural items (like twigs and soft leaves) and so on. Where there are plants, there are wildlife creatures living and feeding among them. Where there are sources of water, there are wildlife creatures drinking or bathing. Of course, the type of garden, the specific region, and the variety of plants offered determines the wildlife creatures that may be present. Discuss wildlife habitats, their feeding habits, and life cycles. Invite a variety of wildlife creatures to the garden by mimicking their habitats and offering their favourite foods. Bright colours, such as red and yellow, are cheery and stimulating to the eyes. They will add excitement and interest to the garden. There are many ways visually appealing plants can help teach children. For example, they can be used to teach children their colours. We could plant specific colours in groups and include labels. Diverse plantings allow the children to experience the wonder of pollination as they watch the various visitors in the garden and talk about the plants that enticed them into it. Along with colourful sensory plants, we could add some whimsical accessories that the children can paint or help create. From colourful walls and murals, to mosaic seating and stepping-stones, colours provoke excitement and interest year round. 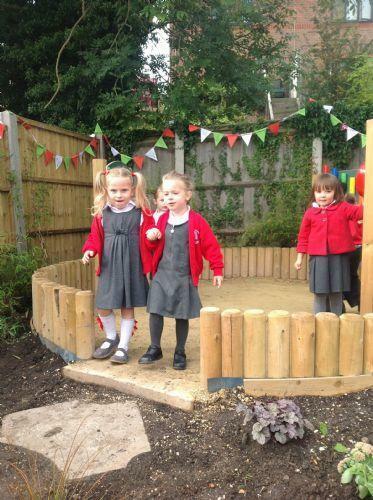 We will include an art gallery of the children’s work within the garden that would be updated regularly. By transforming this overgrown piece of land into a working sensory garden that has been designed and created by the children and their wider community, we hope to communicate the importance of sustainability. We do not often use this word when talking to our 3-7 year olds, but we do emphasise ‘care’. They must care for themselves, care for each other, care for their families and care for the wider community. This will form the backbone of our vision for the Sensory Garden. All gardens change and evolve over time. We want our children, families and neighbours to be involved in the growth of our garden. 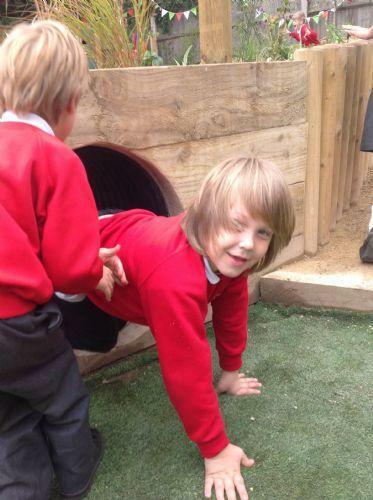 As the children grow and move through school (they are with us for four years) they will have an increasing understanding of the Sensory Garden and learn and enjoy in this new environment. 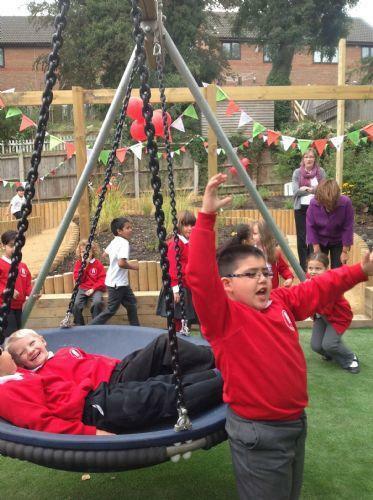 The garden is something more than just a sensory garden, it’s an interactive space where children can instantly enjoy it. But can also create in it and watch it grow. The Mayor cuts the ribbon to open the garden. The Thomas Harding girls enjoyed the cake.